KIEV, Ukraine -- Russia and Ukraine could agree on the extension of the Black Sea Fleet's presence in the Crimea while Viktor Yanukovich serves his first term as Ukrainian president, a Russian lawmaker said. Russia's lease on the Black Sea Fleet's base of Sevastopol is due to expire in 2017, but the new president may look to step back from his predecessor Viktor Yushchenko's strict insistence that the foreign forces leave. "I do not see why we would not be able to agree and sign documents during Viktor Yanukovich's first term [as president] on the extension of the Black Sea Fleet's presence in Ukraine, in the Crimea and Sevastopol after 2017," Ukraine's UNIAN news agency quoted Russian MP Konstantin Zatulin as saying on Saturday. 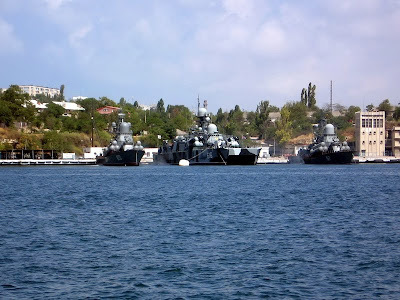 "As far as I know, over 70% of Ukrainians believe that the Russian fleet will not leave Sevastopol in 2017," Zatulin told a news conference in Sevastopol. He also said the issue could be linked with a new natural gas price agreement between Russia and Ukraine. During his meeting with Russian President Dmitry Medvedev on March 5, Viktor Yanukovych, who was sworn in on February 25, pledged to steer a more balanced policy towards Russia and to continue discussions on the future of the Black Sea Fleet bases in Crimea. Russia's Black Sea Fleet uses a range of naval facilities in the Crimea, including the Sevastopol base, as part of a 10-year lease agreement signed in 1997. A Russian-Ukrainian subcommittee on the Black Sea Fleet at the level of deputy foreign ministers holds regular meetings to discuss the implementation of 1997 agreement.